A month and a half ago, when Brazil’s investor class proclaimed its doubts about the reelection of president Dilma Rousseff, no one stood to gain more than Aécio Neves. The grandson of a distinguished pro-democracy activist, Neves (pictured above) represents the next, post-lulista generation of Brazil’s center-right politics. Three decades younger than Brazil’s last conservative president, Fernando Henrique Cardoso, and more charismatic than former São Paulo governor and mayor José Serra, Neves brought to the race a strong pedigree and an accomplished record as an economic reformer as the two-term governor of the powerful, sprawling state of Minas Gerais. That was before the airplane crash that killed former presidential candidate Eduardo Campos, which suddenly catapulted his running mate, the popular Marina Silva, into the presidential race. Where Neves once had credible hopes of becoming Brazil’s next president, he now seems likelier to play a kingmaker role in what’s shaping up to be a fiercely contested runoff between Rousseff and Dilma. Within days, Silva leapt to the lead in polls for the race to become Brazil’s next president. 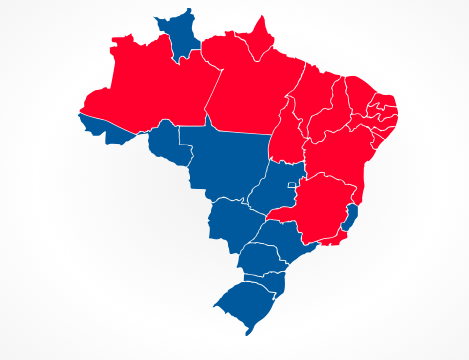 Though Rousseff has now recovered a first-round lead in many polls, Neves is still languishing in third place, far behind both Rousseff and Silva, a reverse from the summer, when Neves held a solid second-place position against the late Campos, who was leading a coalition anchored by the Partido Socialista Brasileiro (PSB, Brazilian Socialist Party) that, until recently, supported the Rousseff government. 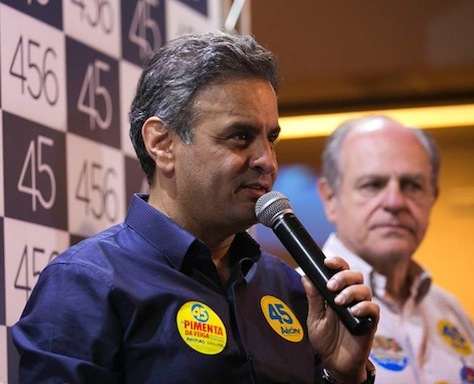 One week after the tragic airplane crash that ended the life of Brazilian presidential candidate Eduardo Campos, his party has quickly minted a new ticket for the October general election. 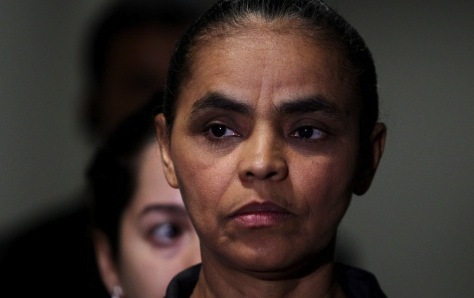 As widely expected, Campos’s running mate Marina Silva agreed to run in Campos’s place as the candidate of the Partido Socialista Brasileiro (PSB, Brazilian Socialist Party), which only last year broke with its longtime alliance with the governing Partido dos Trabalhadores (PT, Workers Party), the party of Brazil’s incumbent president Dilma Rousseff and her predecessor, Luiz Inácio Lula da Silva. For her part, Silva is a former PT legislator and environmental activist, who served as Lula’s environmental minister between 2003 and 2008 before she broke with Lula. She subsequently joined the Partido Verde (PV, Green Party) to run for president four years ago — winning nearly 20% of the vote against Rousseff in the first round of the 2010 election. 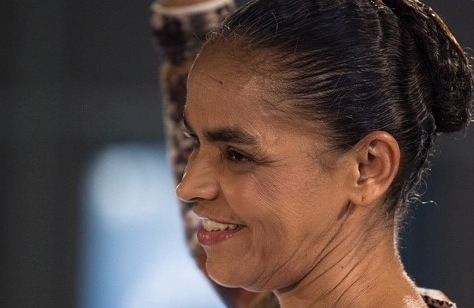 In 2014, difficulties in registering a new party forced Silva to shelve, however reluctantly, her presidential ambitions and she joined the Brazilian Socialists. Campos, the former popular governor of the northeastern state of Pernambuco, named Silva as his running mate. 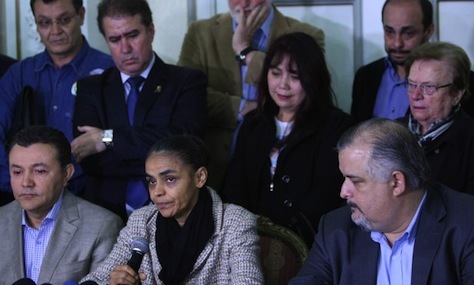 That all changed last week with the air crash in São Paulo state that killed Campos and brought the Brazilian election campaign to a halt as Rousseff, Silva and the rest of Brazil’s political class paused to mourn Campos. With 10 days to select a new candidate, and with just weeks to go before the election’s first round on October 5, the PSB chose Silva over the weekend to lead its ticket, on the condition that Silva, who hasn’t always been the most disciplined candidate in the past, and who is a newcomer to the PSB, will continue to honor the party’s electoral program and regional alliances. Technically, like Rousseff and center-right challenger Aécio Neves, Silva will head a coalition of parties in the presidential race. Silva’s coalition, though dominated by the PSB, also includes five smaller parties, such as the Partido Popular Socialista (PPS, Popular Socialist Party). 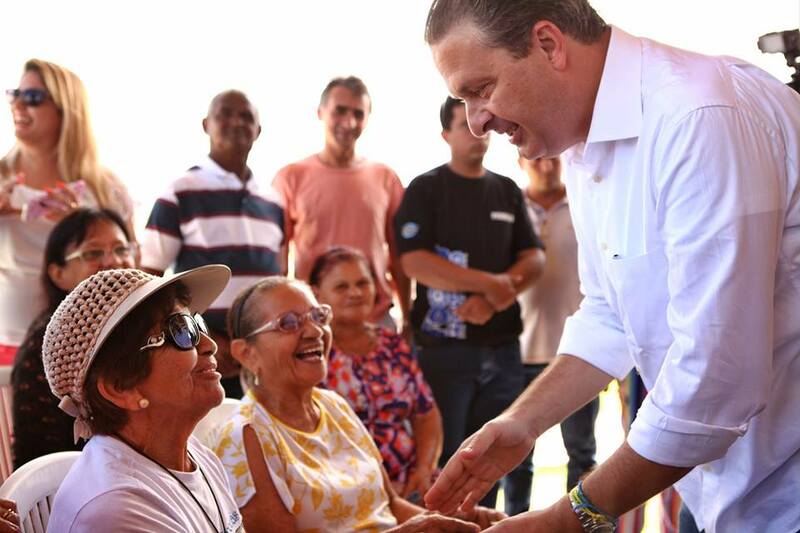 It will take more than ten days for the followers of former Pernambuco governor Eduardo Campos to mourn the untimely death of their candidate in the presidential election that’s now less than eight weeks away. But within the next ten days, the party that Campos led, the Partido Socialista Brasileiro (PSB, Brazilian Socialist Party), coordinating with the coalition that supported his presidential candidacy, must turn to the pressing reality of selecting a new candidate, who must then hit the ground running as the general election campaign is set to begin. 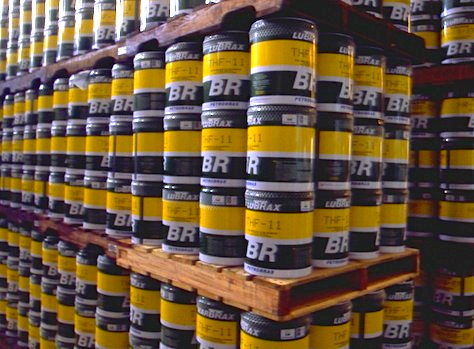 There’s no way to underestimate the impact of Brazil’s October general election. With around 203 million people, Brazil is the world’s fifth-most populous country, and it’s the most populous country in Latin America, where the Brazilian president holds significant regional political clout. Despite recent troubles with growth and the value of its currency, Brazil’s $2.25 trillion economy is also the largest in Latin America and the seventh-largest economy in the world, and its status as one of the BRICs makes it one of the leading global emerging markets. There’s no rule that Campos’s running mate will automatically succeed him, but no one is more prepared to take on that challenge than vice presidential candidate Marina Silva (pictured above, as Campos looks on), the former environmental minister who placed third in the last presidential election in 2010. Eduardo Campos, a popular former two-term governor of the northeastern Brazilian state of Pernambuco, and a former minister of science and technology nearly a decade ago under former president Luiz Inácio Lula da Silva, died at age 49 today in a tragic airplane crash while campaigning in the coastal state of São Paulo earlier today. Campos was one of seven people on board the small plane, all of whom died when the aircraft crashed into a neighborhood in the port city of Santos, reportedly due to poor weather. Dilma Rousseff, Brazil’s president, and Campos’s rival in the upcoming October presidential election, called for a three-day period of national mourning and suspended her own campaign activities. Campos (pictured above) was selected as the presidential candidate of the Partido Socialista Brasileiro (PSB, Brazilian Socialist Party). 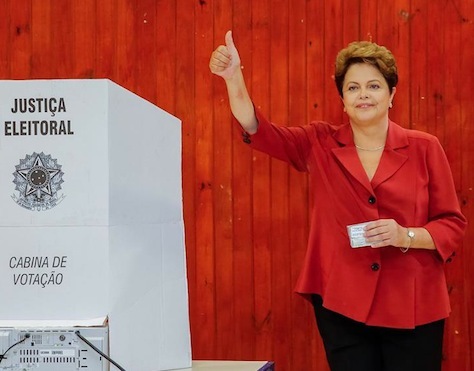 Once a supporter of Lula da Silva and his successor, Rousseff, the Brazilian Socialists, under Campos’s leadership, left Rousseff’s broad government coalition last November, and the party has been gaining support in recent years. 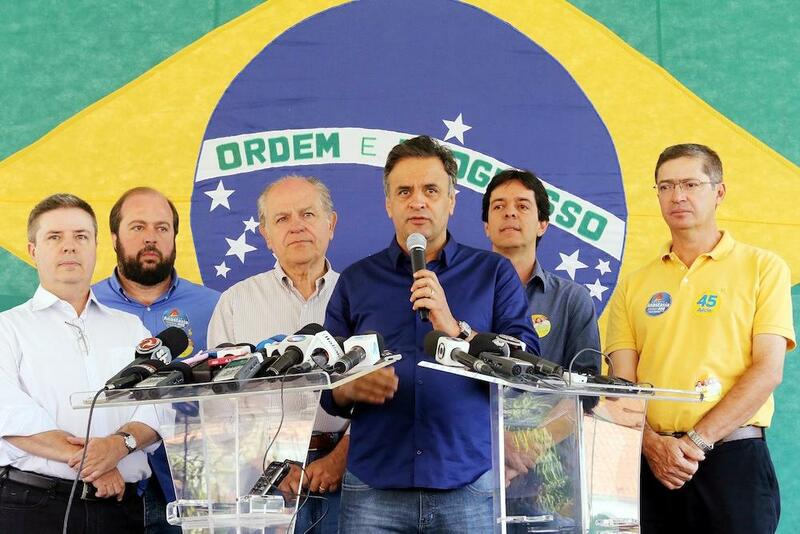 Polls generally showed that Campos trailed Rousseff, who is seeking reelection as the candidate of a wide coalition headed by her own Partido dos Trabalhadores (PT, Workers Party), as well as the more center-right candidate, Aécio Neves, the candidate of Serra’s center-right Partido da Social Democracia Brasileira (PSDB, Brazilian Social Democracy Party). The most recent Ibope survey, dated August 3 to August 6, gave Rousseff 38%, Neves 23% and Campos 9%, though the race was expected to narrow as more Brazilians paid increasing attention to race. Accordingly, Campos and his popular running mate, Marina Silva (who was not on the flight with Campos), were capable of building a serious campaign alternative to both Rousseff and Neves, with possible banks of support among urban progressives in cities like Rio de Janeiro and Brasília; rural voters from Campos’s Nordeste region, who have tilted tilting more to the left in recent years; and former lulista supporters disenchanted with the growing centrism of the Worker’s Party. The PSB, and the wider coalition that had united to support Campos, has ten days to decide how to replace Campos, but Silva would almost certainly be the best to carry forward Campos’s legacy, and she’s by far the most well-known candidate who could so quickly replace Campos. Late last year, Campos formed an alliance with former presidential candidate Marina Silva, a former environmental minister, green activist, evangelical and prominent Afro-Brazilian figure who won nearly 20% of the vote in the last presidential election in 2010. Though Silva was running as Campos’s running mate in the current election, and she even formally joined the Brazilian Socialists to do so, many of her fans believed that Silva — and not Campos — should have led their joint ticket. Running on the strength of Campos’s legacy, her own popularity and the broad leftist platform that the PSB and its allies espouse, Silva’s candidacy could upend the race into a close three-way contest. 13. 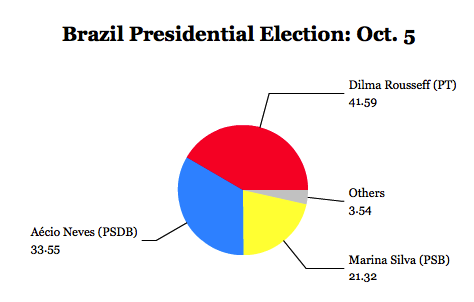 Brazil general election, October 5 (presidential runoff on October 26). Though Brazilian president Dilma Rousseff holds a wide polling edge that favors reelection, her broad support is not necessarily deep, as demonstrated by the massive anti-government protests in 2013 that resulted from increased public transportation fees and eventually targeted Brazil’s stagnant economy, poor job opportunities and political corruption. An economy that was not long ago soaring grew by just 0.9% in 2012 and is expected to grow by a hardly stellar 2.5% in 2013. 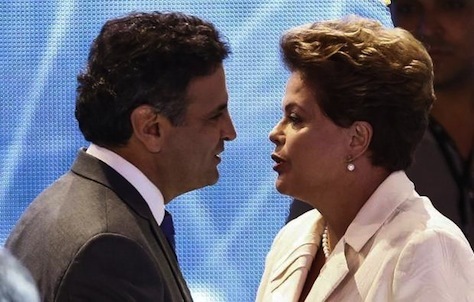 What’s more, Rousseff (pictured above) still has to get through most of 2014 — and there’s plenty of time for the opposition to upend her lead. She’s running for what would be the fourth consecutive presidential term for the social democratic Partido dos Trabalhadores (PT, Workers Party), itself testament to the enduring popularity of former president Luiz Inácio Lula da Silva. 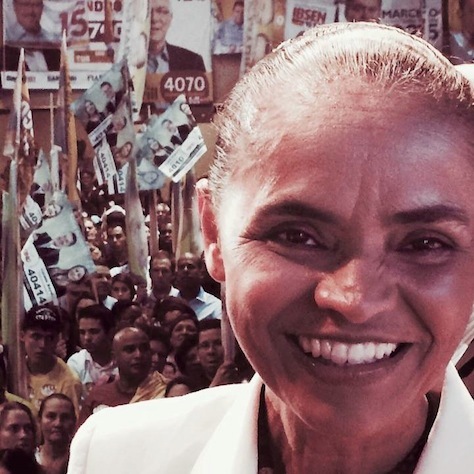 Her prospects became more difficult in October 2013, when former presidential candidate Marina Silva decided to join forces with the candidate of the Partido Socialista Brasileiro (PSB, Brazilian Socialist Party), Eduardo Campos, the two-term governor of Pernambuco state in northeastern Brazil. 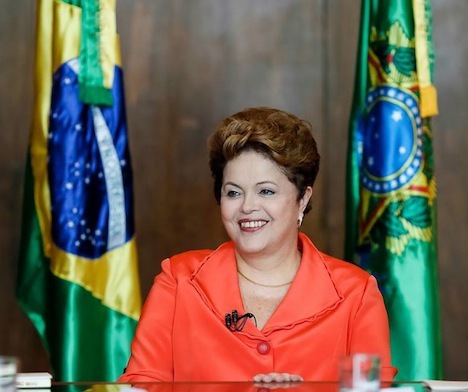 Though it unofficially supported Lula da Silva’s reelection in 2006 and formally supported Rousseff in 2010, the PSB left Rousseff’s government in September 2013. Though Campos is (for now) the presidential candidate, his running mate is by far a much more popular figure nationally. One of Brazil’s most prominent politicians of African descent, Silva served as Lula da Silva’s environment minister between 2003 and 2008, where she earned a reputation as a staunch defender of Brazil’s fragile rain forests and often found herself at odds with the more business-friendly instincts of others within her own government. Running as the candidate of Brazil’s Partido Verde (PV, Green Party), she won 19% of the vote in the first round of the October 2010 presidential election, and she was trying to found a new ‘sustainability party’ in 2013 before obstacles made that path impossible. Campos, who likewise served in Lula da Silva’s administration as minister for science and technology between 2004 and 2008, became Pernambuco’s governor in 2007 and was reelection with 82% of the vote in 2010. The combination makes for an amazingly balanced ticket. Campos’s geographic base is Brazil’s northeast, while Silva has more support in the south and southeast. Campos is popular among business interests and could credibly appeal to conservatives who chafe under the increasingly regulatory intervention of Rousseff’s administration, while Silva is popular among younger Brazilians who are disenchanted with politics as usual. They’re both opposition candidates who nonetheless have ties to Lula da Silva, bringing some continuity with Brazilian policy over the past decade. 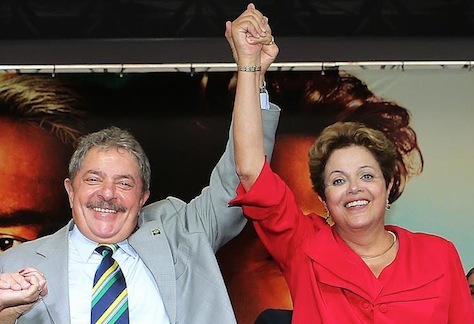 Together they could build a credible anti-Rousseff coalition from among voters to her left and to her right, especially in a runoff. 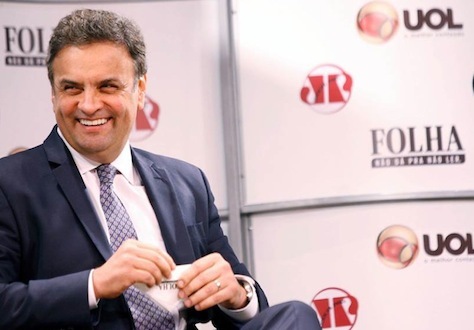 Brazil’s center-right Partido da Social Democracia Brasileira (PSDB, Brazilian Social Democracy Party) will likely be represented by Aécio Neves, who served as governor of Minas Gerais, the second-most populous state in Brazil and home to Belo Horizonte, from 2003 to 2010. As governor, Neves cut the state’s budget and promoted investment, transforming the state’s fiscal outlook in a way that attracted national and international regard. In 2010, he was elected to the Senado Federal (Federal Senate), the upper house of Brazil’s Congresso Nacional (National Congress), and in 2013, he became the leader of the PSDB, making him the favorite to become its 2014 presidential contender as well. With so much time until the election, the presumed candidates aren’t fully settled — and parties don’t have to make decisions until 2014. Silva and Campos could change places on the ticket, for example. Conceivably, Rousseff could step aside for former president Lula da Silva, though he announced early in 2013 that he wasn’t running and that he was supporting Rousseff for reelection. If Neves falters on the campaign trail, José Serra, the former São Paulo mayor, São Paulo state governor, planning minister and health minister could replace him on the ticket. But at age 71, Serra is seen as yesterday’s man — he lost the 2002 presidential race to Lula da Silva by a wide margin and lost a second bid in the October 2010 race to Rousseff by a margin of around 56% to 44%. What’s more, he lost a comeback bid to return as mayor of São Paulo in October 2012 by a similarly wide margin. Brazil will also elect one-third of its Senate (27 out of 81 seats) and all 513 members of the Câmara dos Deputados (Chamber of Deputies), the lower house of the National Congress. Despite over a dozen major parties with at least 10 deputies, the parties align into a ‘lulista’ bloc and a center-right bloc, which gives Rousseff a majority in both houses, including 50 senators and 325 deputies. 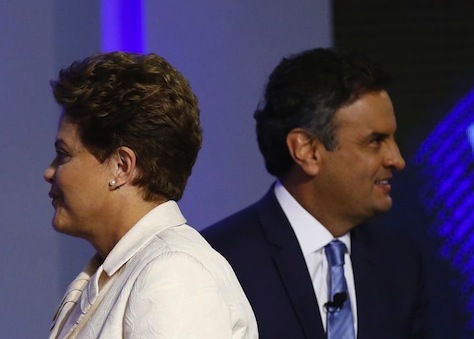 Other parties who support Rousseff’s government, however, are still undecided as between Rousseff and Campos, including the second-largest party in the National Congress, the big tent Partido do Movimento Democrático Brasileiro (PMDB, Brazilian Democratic Movement Party), and the center-right Partido Progressista (PP, Progressive Party).